Minutes away from 5 Golf Courses! Heated Swimming Pool! Beautiful Grounds. Completely remodeled clear to the Studs. All Brand new including Furniture and Appliances! Spacious one bedroom one bath! Stunning! 2nd Floor Condo with Laundry and Trash just steps outside the front door! Elevator is very close for those that choose to use it! This beach home comes with a Brand New King Size Bed! Brand new Sleeper Sofa should you have a friend come stay. Beautiful view of the pool and beach! Newly painted and decorated! Very Upscale so sorry no children allowed. Completely furnished turnkey vacation home. All the amenities of being at home. Keurig coffee maker, toaster oven, large oven/stove and large double-sided refrigerator along with dishwasher. Two large flatscreen TV's. One in the Living room and one in the Master bedroom. Puzzles and Books for those rainy aren't many! We include Cable, private wifi and landline phone with US calls for free. So working while on vacation (which many of us do) is easy while you sit in the breeze! :) All Utensils and cookware are provided. Our oversized porch (which is larger than the two-bedrooms) is super comfy and relaxing! There are two Tall beach chairs and two low beach chairs. There are two boogie boards, paddle balls and bocce ball games. Restaurants are located nearby and across the street. Downtown New Smyrna Beach (Historic Flagler) is an easy 3 mile bike ride or Uber! Amenities of the community include a heated pool, grills, clubhouse and large outdoor gazebo for gathering. There are also Tennis Courts, pickleball court, shuffleboard courts and a lovely beach for walking and enjoying! Love to spend the day out on the fairways? You’ll find plenty of options to enjoy here in NSB, like the NSB Municipal Course, the Venetian Bay Golf Club, Sugar Mill Country Club, Hidden Lakes Golf Course, or The Preserve at Turnbull Bay. 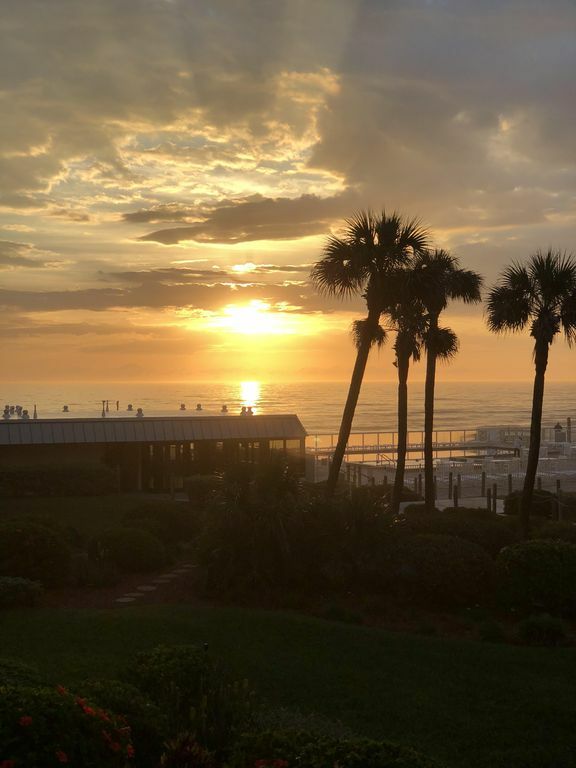 New Smyrna Beach was voted Best Beach in Florida! We are Chuck & Karen Mason. We recently purchased this one bedroom unit. We used to own a 2 bedroom unit and LOVED it and LOVED this complex. We sold it to some friends who also fell in love with Castle Reef. We missed it so much we bought this one! We are looking forward to spending time here and we know you will too! If you come and are missing anything please do not hesitate to contact us! We want your vacation to be amazing! As a kid we vacationed here every summer. As an adult we brought our kids every summer and now as Grandparents we bring our Grandkids. This was my fathers Favorite place to be! It has deep meaning to me and my family! Walk across the street to the Grocery store. It is awesome having it so close! C's Waffles is the best in town also directly across the street. Going out? No problem you can get your nails done as well across the street! The location is amazing. It is a no drive beach so no worries about the cars! Plus only 3 miles to Flager Street Shopping. Large flat screen and one in the bedroom. Had a great time at Castle Reef. It's in an excellent location on the non-driving beach. The landscaping around the complex is top notch and well cared for. The unit where I stayed was just the right size for me. It was very recently renovated will all new fixtures and furniture. It also comes equipped with just about everything that I or anyone would need for a stay. During the time that I was there (admittedly off season) it was very quiet and the beach was very uncrowded, just the way I like it. Also, there is a small plaza across the street with a Dollar General, pizza shop and a few other businesses. All in all, a very pleasant stay. Beautifully decorated, comfortable and clean. Perfect location on the beach. Absolutely a lovely beach home. The decor is elegantly nautical and the condo is very well thought out. Gigantic televisions 👍�🏻� -- "Jack and Jill" one bath with separate master vanity makes the one bathroom much more functional. Gorgeous shower! Very generous kitchen and beach supplies. Thank you for sharing your beach home. One of the best places we’ve stayed at NSB.